A story of romance, realization and a desire for independence in the Depression-era American heartland – it’s not what you might expect when you think of the typical opera, but it’s the perfect story for students who might be going through the same challenges themselves. Diverging from the despondent drama of last quarter’s Dialogues of the Carmelites, The Tender Land, running May 18-21 at Cahn Auditorium, provides audiences with the story of a young, Midwestern girl, Laurie. As she prepares to graduate high school, Laurie navigates quarrels with her protective mother and grandpa and her love for a traveling farm worker, Martin. Drama lovers, don’t worry: this show provides plenty, but it’s mixed in with jovial celebration, exciting dancing and plenty of laughs. The variety of emotions on display throughout the show provide relatable aspects for all audience members, and stage manager Daniel Drake said students can find parallels in Laurie’s unique story arc. Bienen and Weinberg freshman Sarah Zieba, who plays the postman’s wife Mrs. Splinters, agrees with this sentiment, and said the show holds an important lesson for young dreamers. Laurie is anxious to graduate high school and be able to forge her own path. Act 2 takes place at her lively graduation party, which features something you don’t usually see in an opera: dancing. Even with this involved choreography, Drake said, the process has been very smooth, thanks to the talent of the team around him. Drake said managing a show at a university is a unique experience because of the learning aspect, but that he, and the rest of the production team around him, treasures the chance to work with students. Many students will be able to find parallels in the fiddling, foot-stomping fun of the opera, whether in the rapid story of love between Laurie and Martin, the parental oversight of Ma and Grandpa or the eternal hunger of Martin’s friend Top. 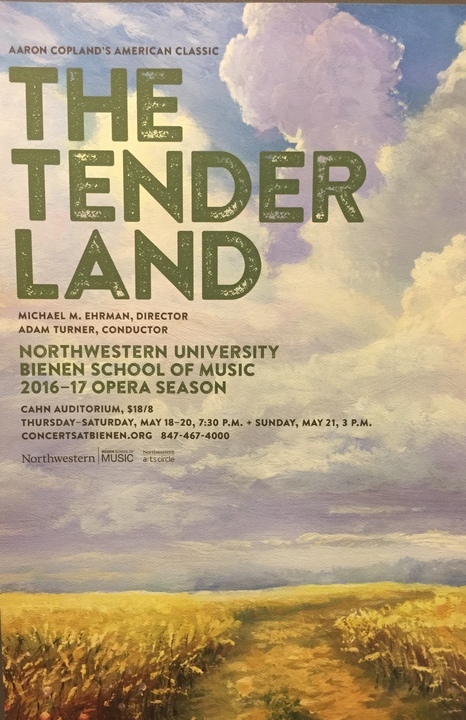 The Tender Land plays May 18-20 at 7:30 p.m. and May 21 at 3 p.m. at Cahn Auditorium. Tickets are $8 for students.